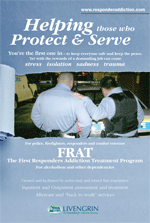 reaching out to police, firefighters, emergency personnel and combat veterans. Alcoholism or other dependencies complicate the stress and physical and emotional trauma of dealing with life-threatening situations. Addiction is no stranger to "those who go in first." A dependency might actually destroy a person's health, family life and career. On top of that, an individual also has to bear the unfair stigma that the addicted person "doesn't have enough will power," or "made the wrong choices." But we know (as does all of the medical community) that addiction is a disease with a medical and behavioral basis, requiring care, understanding and professional treatment. Get help NOW for yourself, loved one, or somebody on the job. Meet the experienced program managers. "Sometimes the helpers need help themselves - when they do, we turn to FRAT." © 2019 Livengrin's FRAT Program. All Rights Reserved.